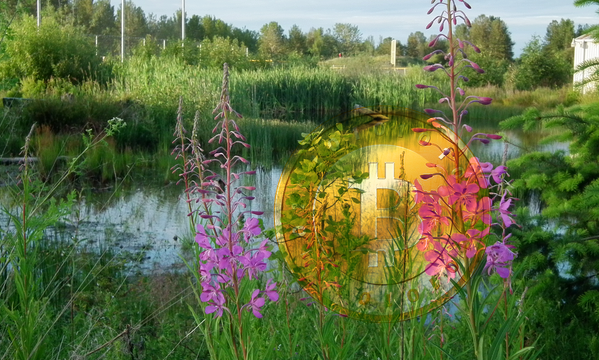 For the Bitcoin community, June has been a month of mixed blessings. The price tumbled frm $128.8 to $97.5 (and currently stands around $70), major Bitcoin network statistics like the number of transactions per block and the number of unique Bitcoin addresses used took a nosedive, and the Bitcoin Foundation received a cease and desist letter from the state of California’s Department of Financial Institutions. On the other hand, Google Trends volume, a statistic which estimates the global level of interest in Bitcoin, at least temporarily stopped its decline, and is now back at May 19-25 levels, or 20% of the peak. Media attention was mixed, with some articles arguing that Bitcoin “is losing its shine” and others saying that it is now “getting its groove back” following a few instances of good news. As far as the price and popularity are concerned, it is my own thesis that we have now returned to a pattern that old-time Bitcoiners know all too well: the Gartner Hype Cycle. 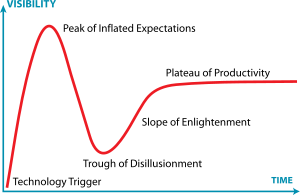 The Gartner Hype Cycle is a pattern that many technologies, ranging from machine learning to space exploration and virtual reality, consistently tend to face, and has five stages: (1) a “technology trigger”, (2) a “peak of inflated expectations”, (3) a “trough of disillusionment”, (4) a “slope of enlightenment” and finally (5) a “plateau of productivity”. Bitcoin users in 2011 and 2012 would frequently refer to this model, saying that the currency’s crash from $30 was simply the result of a hype bubble popping and a sign that the “real work” was only starting to come to fruition. In late 2012 to early 2013, many believed that the plateau of productivity was finally here. As it turns out, that was not the case – in fact, 2013 proved to be the start of a whole new hype cycle. However, this time is different. Although some anti-Bitcoin viewpoints have certainly come to the forefront, by and large today, unlike in 2011, the hopeless pessimism is simply not there. Investors have plunged into Bitcoin, and have committed themselves to working for the long haul. Hardened users have seen the Bitcoin price crash before, and are ready to live through a crash for a second time – that is, of course, if the crash is not already close to its bottom. The World Bank held a panel on “the legal and regulatory challenges” of digital currencies. The agenda was made up of four main parts: an overview of virtual currencies, implications for payment systems overseers, two panels on illicit activities and recent regulatory actions by the US Treasury. MtGox published an ad in the official magazine of the annual G8 summit, which took place in Ireland this year. The Dutch and Australian governments confirmed that Bitcoin earnings will be taxable. “Bitcoin is no more anonymous than physical cash and the ATO has experience in working with earlier forms of ­anonymous electronic money systems, and with physical cash, which are relevant for responding to new and emerging­systems,” the Australian Taxation Office senior assistant commissioner wrote. The German government took a different tack: if the time between when one buys bitcoins and sells them is longer than a year, any capital gains income from the investment is tax-free. The Government Accountability Office in the United States published a report detailing when digital currency systems are taxable and when they are not, and stated that the IRS was not interested in creating Bitcoin-specific rules. California’s Department of Financial Institutions sent a cease-and-desist letter to the Bitcoin Foundation telling them to stop engaging in money transmission activities. The Bitcoin Foundation has since replied, arguing that it was not selling bitcoins, and even if it was selling bitcoins does not constitute money transmission in California. MtGox appears to be well on its way to resolving its conflict with the Department of Homeland Security, having recently created a new Delaware corporation in the United States and applying for a FinCEN money services business license. LibertyBit, the second largest Canadian exchange, has shut down its operations and has refunded customers’ money, citing banking concerns and fraudulent transactions. Satoshi Square, a weekly in-person Bitcoin exchange event in New York, expanded is operations to Los Angeles. Bitcoin Exchange Berlin, another in-person Bitcoin exchange event in Berlin, had its first session on June 29. BTCGlobal, a company seeking to massively reduce the barriers to entry to creating a Bitcoin exchange in the US, announced itself to the public. BTCGlobal intends to develop a Bitcoin trading platform and obtain money transmitter licenses in all US states that require them, and then franchise out the licenses and technology to partners. Draper University of Heroes, a four-month live-in program created by Tim Draper that seeks to teach college-age students how to become entrepreneurs, started accepting Bitcoin. Coinbase secured an investment of undisclosed size from IDG Ventures, a company located in China. Yumcoin, a platform that seeks to make it easier to sell digital goods for Bitcoin, opened its doors. Kenilworth Exploration, an Australian mining company, started issuing shares on BitFunder, one of the most popular Bitcoin-based trading platforms. PayPal announced the PayPal Galactic Initiative, a project seeking to develop a financial system suitable for interplanetary trade. Butterfly Labs, the first ASIC Bitcoin mining company to open up pre-orders for its products in June 2012, started shipping its 30 GH/s Little Single miners. SecondMarket, an alternative stock market for private companies and accredited investors, launched a Bitcoin Education Center, an online resource where Bitcoin enthusiasts and newbies alike can learn about all things Bitcoin. The mining pool BTCGuild started selling ASICMiner’s 336 MH/s Block Erupter USB devices, and sold out within forty minutes. Also, ASICMiner reduced prices on the devices from 1.99 BTC to 0.89 BTC. Mike Hearn and Matt Corrallo have added micropayment channels to BitcoinJ, allowing users to pay a microbitcoin at a time for services like internet connectivity without creating a new transaction for each incremenet in payment. Essentially, the protocol works by repeatedly replacing a transaction with a new transaction that gives slightly more money to the recipient. Porcfest, the Free State Project’s annual camping event near Lancaster, New Hampshire, took place for the tenth time last month; over two thirds of the merchants accepted Bitcoin. Atlantis, a new startup competitor to the (in)famous online drug market Silk Road, released an advertising video of its own, telling the story of “Charlie” who moved to a new city and was not able to find any weed. TorBroker, an anonymous service allowing users to invest in real-world stocks, released an advertising video and made a number of upgrades to its service. Michael Mancil Brown, an individual best known for attempting to blackmail Mitt Romney for $1 million in BTC over his tax returns, was indicted on extortion and wire fraud charges.